The Mahindra KUV100 might be marketed as an SUV, but it is essentially a pumped up hatchback; one that will compete against the likes of the Maruti Suzuki Swift, the Hyundai Grand i10 and the newly launched Ford Figo. So, it has a monocoque chassis, a transverse mounted engine and front wheel drive. But, because it must be referenced as an SUV, the KUV100 naturally has high ground clearance too; 170mm of it. It isn’t very large though. At 3675mm in length, it is the shortest in its class. And its 2385mm wheelbase is the least as well. But the KUV100 stands tall at 1655mm (with roof rails) making it the tallest. 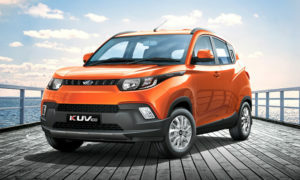 Mahindra KUV100 Ex Showroom Price in New Delhi ranges from 4,58,282/- (KUV100 K2 Petrol 6 Seater) to 7,35,632/- (KUV100 K8 Petrol 6 Seater) .Mahindra KUV100 has 11 Variants of Petrol are available in India. Mahindra KUV100 comes in 8 colours, namely Flamboyant Red,Fiery Orange,Dazzling Silver,Midnight Black,Pearl White,Dazzling Silver/Metallic Black,Designer Grey,Flamboyant Red/Metallic Black.